Did the people who planned World Trade Center 7’s demolition think we wouldn’t notice? Perhaps they thought that seven hours after the twin towers exploded, we wouldn’t notice that a forty-seven story steel frame building fell into its own footprint in less than seven seconds. They were almost right. In the climate of jingoistic fear that followed 9/11, people with guts had to point it out. They had to draw our attention to it, and demonstrate the significance of this controlled demolition in the framework of the day’s events. Skeptics say they want a smoking gun to prove wrongdoing, especially when we accuse our own government. For attorneys in court, smoking gun evidence is so fresh, material, and decisive that the other side cannot contest it. In World Trade Center 7, the perpetrators of the 9/11 crimes handed us a smoking gun. All the evidence for destruction of building seven indicates a controlled demolition. No evidence contradicts this assessment. Seldom does one event so conclusively demonstrate prevarication and ill intent on the part of people who lie to us. 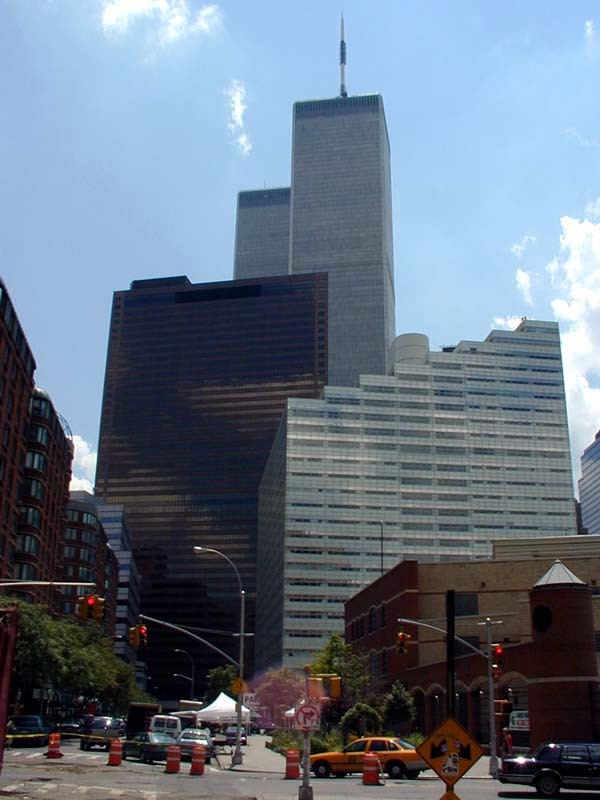 World Trade Center 7 is the brown building, with the Twin Towers directly behind. Architects & Engineers for 9/11 Truth deserve our gratitude and recognition. The film makers assemble good evidence here. These experts put their professional and personal reputations on the line to determine what actually happened on 9/11. They criticize the government’s reports directly. Doing so, they risk questions from their friends, ridicule from their colleagues, and even ostracism from their professional communities. We have seen people lose their livelihoods for speaking out. If all of these professionals can face down these consequences, so can we.